Rogue, Sunfire, Morph, Sabretooth (with Wild Child over his shoulder), and Blink are all in Chicago trying to save the humans there from being killed by Holocaust’s impending attack. The humans are panicked and fleeing, and things are made worse when suddenly Sunfire loses control and starts flaming out in front of them all. Rogue is forced to absorb his powers to calm him down, and in doing so she views his memories of a time when Apocalypse killed his friends and family while Nemesis held him back. Nemesis being Holocaust’s former identity. This is all presented in a very heartfelt and dramatic way that is very touching. Also, seeing how scarred and damaged Shiro seems to be by his powers is also quite shocking and adds to the tragedy. Meanwhile, Blink and Sabretooth are off alone and discussing their own plan. In order to give everyone the best chance, Victor wants Blink to send him directly to where Holocaust is now so he can take him on and slow him down. He fully accepts that it is a suicide mission. Blink initially balks at this, unable to see her mentor go. This moment is very sweet and touching, and it’s a sharp contrast to the psychopathic killer we’re used to seeing in the main timeline. They were clearly trying to suggest that in different times Victor could be very similar to Wolverine, though I have to admit it’s a little hard to believe that this guy is one and the same. Still, it’s a well executed moment. Rogue tries to stop their plan but Blink temporarily subdues her and sends Victor off. He and Wild Child are transported to Indianapolis, directly in front of Holocaust. Holocaust plays the role of a bond villain expertly by revealing to Victor where his Infinite processing plant is – i.e. the place where they create the soldiers who serve Apocalypse – because he’s confident that Sabretooth will be dead soon anyway. However what he didn’t realize is that Wild Child is not quite as wild as his name suggests, and Victor sends him off hurriedly to spread that bit of news. 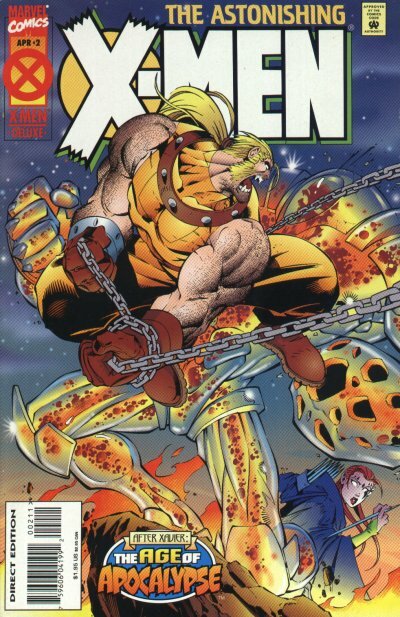 Why Holocaust doesn’t run after him but instead sticks around to fight Sabretooth, we’ll never know. Regardless the two of them duke it out, and reveal that it was Magneto who put Holocaust into his current state as revenge for killing the Scarlett Witch. Sabretooth tries to rip the head off his containment unit, but apparently that doesn’t work very well to hurt him and instead he ends up beaten on the ground unconscious while Holocaust moves on to Chicago. Back in New York, Bishop asks why Magneto isn’t out there with his followers. He holds the baby Charles in his arms and explains to Bishop that if he must destroy this world as Bishop suggests, than he should be allowed this night to say goodbye to his son. Not far away, Apocalypse has located Magneto’s current location and proudly announces that he is coming for him himself. Say what you will about Scott Lobdell as a writer these days, but there were definitely times in the 90s where he really was fantastic at character moments, and this is one of them. Rogue and Shiro, Victor and Blink, and Magneto and Bishop all have really strong moments together here, and credit must also be given to Joe Maduriera’s art as well for helping to convey that emotion. All around just a good, solid issue, and while some of the other series in this event seem to be specializing in weirdness, Astonishing seems to be holding on to what the X-men are all about, regardless of the reality they are in. This entry was posted in One Man's Worth by Angie. Bookmark the permalink.